Two women relatives of Shannon Matthews' stepfather arrested in connection with her alleged abduction have been released on police bail. Shannon's stepfather's mother Alice Meehan, 49, and sister Amanda Hyett, 25, were held earlier on Friday. 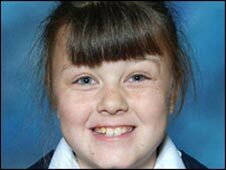 Nine-year-old Shannon went missing for 24 days after failing to return home from school in Dewsbury, West Yorks. Her stepfather's uncle Michael Donovan, 39, has been charged with kidnapping and false imprisonment. Amanda Hyett, of Moorside Road, Dewsbury Moor, was arrested on suspicion of assisting an offender while Alice Meehan was arrested on suspicion of attempting to pervert the course of justice. A West Yorkshire Police spokesman said: "The two women aged 25 and 49 arrested earlier in connection with the kidnap of Shannon Matthews have both been granted police bail pending further inquiries. "They are required to reattend in May." Shannon was found hidden in the base of a bed in a flat a mile from her home on 14 March, 24 days after she went missing. Her stepfather, Craig Meehan, 22, has been remanded in custody by magistrates in Dewsbury charged with possessing indecent images of children.